I... don't really have to review Hugo, do I? I mean... y'all have already read it, right? And if you haven't read it, you've at least read all about it, yes? Well. Here's what we'll do. Since I resolved to read and review all the 2009 Caudill nominees, I will share with you what I wrote about this book when I read it in March. But then I'll also link to some better reviews. Deal? Deal. An innovative book with beautiful art. This book is not quite a graphic novel, nor is it complete without the pictures. I don't think I'd have been interested in the story on its own, but the drawings are more than worth cracking this puppy open." And be sure to check out other reviews at: Becky's Book Reviews, Fuse #8, and Hypothetically Speaking. 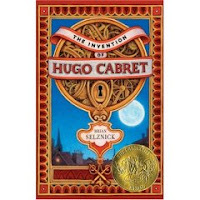 And then read Susan's post about why Hugo was going to break her heart (thank goodness it didn't! ).